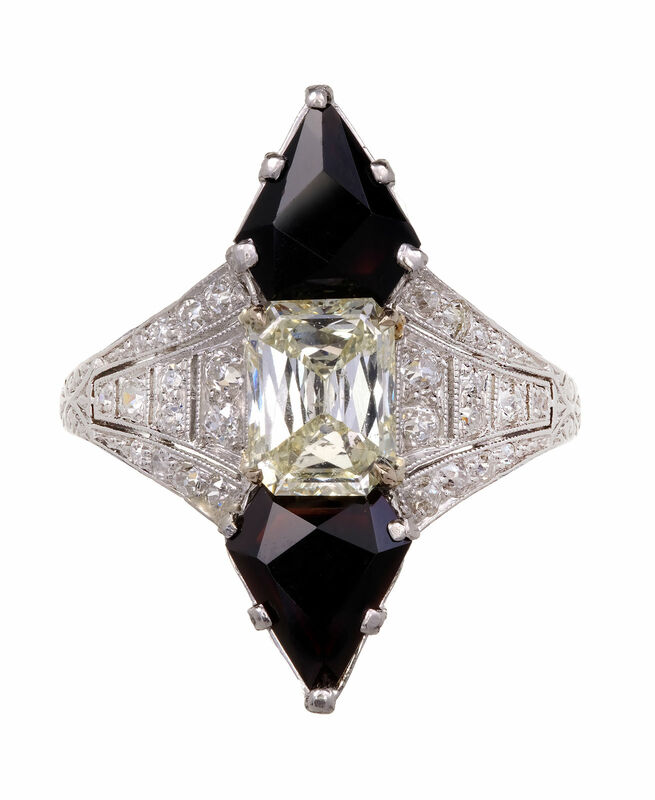 All original Art Deco black star & Frost one of a kind ring with diamond shape Calibré cut black Onyx and a beautiful Emerald step cut center diamond. In the early 1900’s diamonds with a hint of warm color and few flaws with good cutting were prized and sought after. We believe this was a custom design privately commissioned ring because of the unique one of a kind design. 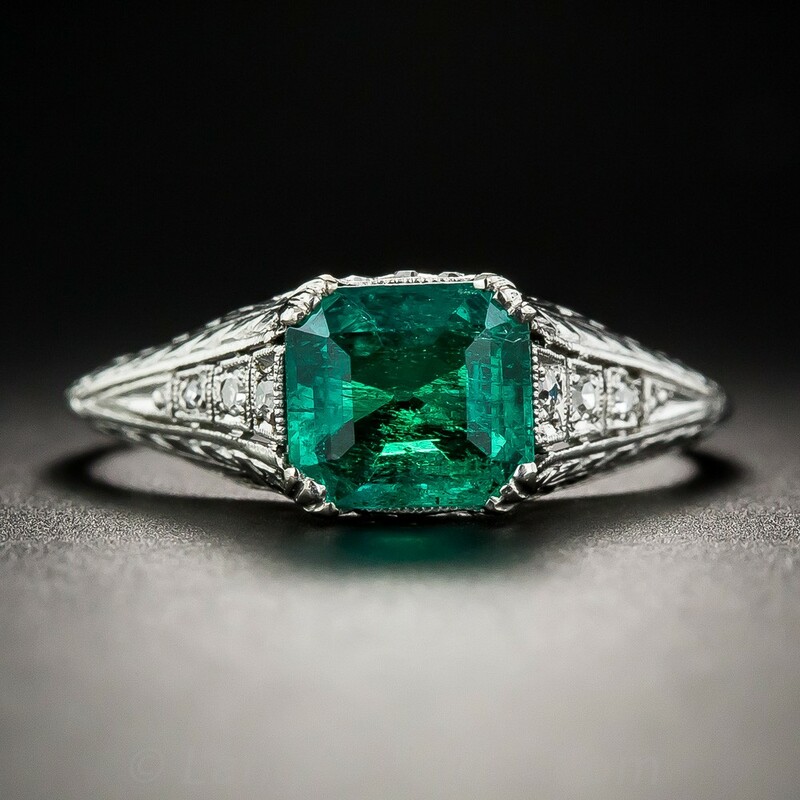 Art Deco Emerald, Diamond, Platinum Ring The ring features a square-shaped emerald measuring 6.00 x 6.00 x 5.45 mm and weighing approximately 1.15 carats, enhanced by elongated hexagon-shaped diamonds measuring 7.00 x 3.00 x 2.25 mm and weighing a total of approximately 0.65 carat, set in platinum. 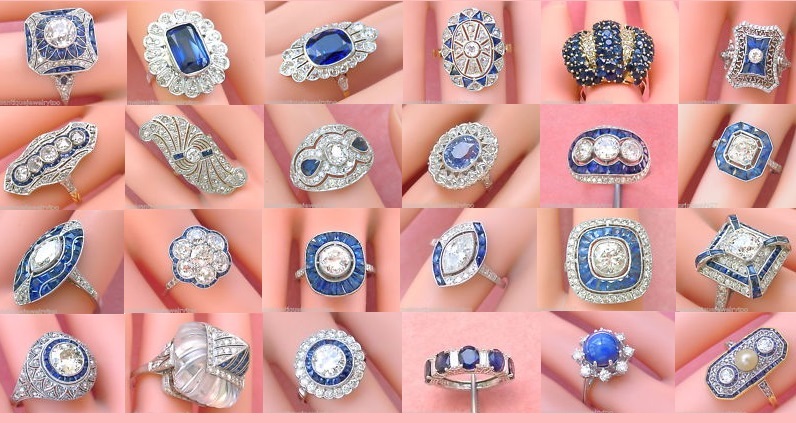 These are a few of the many pieces of gorgeous sapphire and diamond estate jewelry that can be found online, or by actually going to an estate sale. 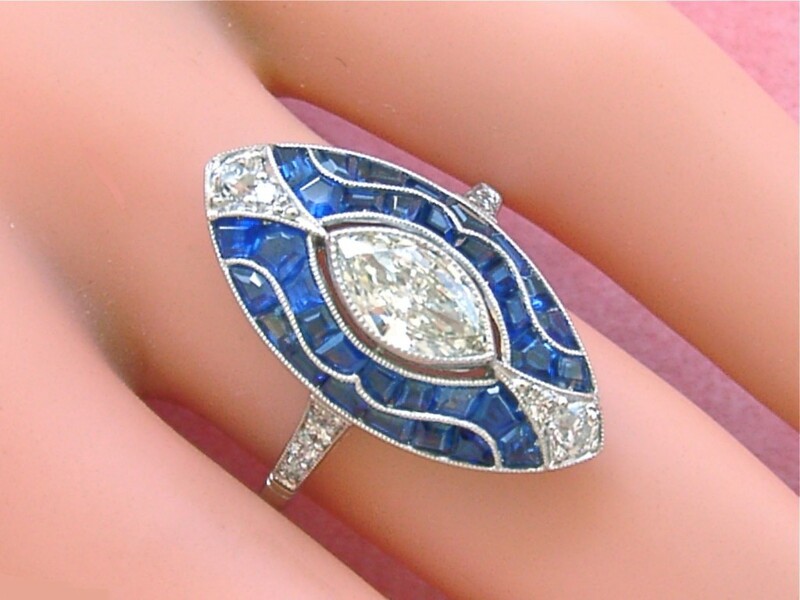 Great prices can be found on sapphire jewelry at estate sales and auctions. Many times you can find stunning designs that are one of kind, and will never be created again. These gorgeous rings have been someone’s treasure for a long time, and many are considered antiques or vintage jewelry. Now you can be the owner of such treasures with a little time and effort in seeking them out. The enjoyment one gets from hunting for such gorgeous treasures can be as much or more fun as wearing these exquisite pieces of jewelry. Estate jewelry can be a rare find, and seeking these treasures will leave you with a satisfaction rarely achieved by many individuals. 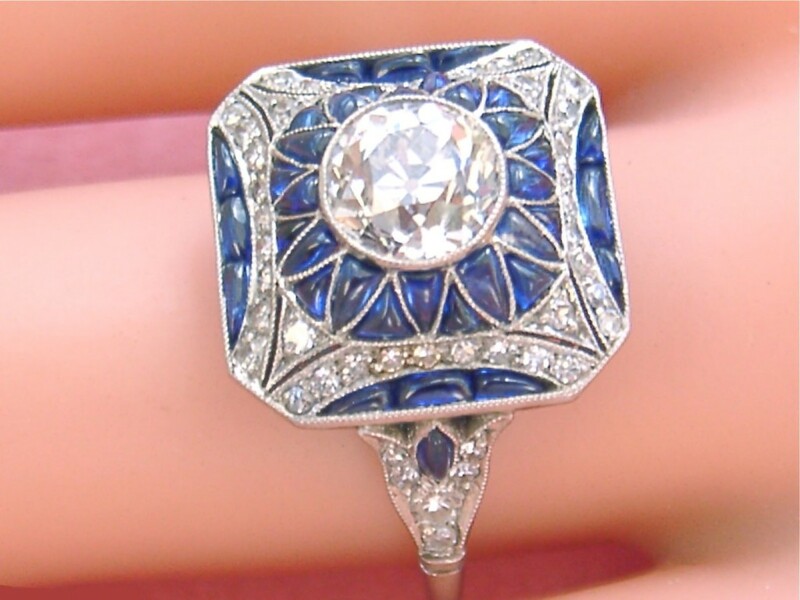 This is a absolutely stunning estate ring that was made from platinum in the Art Deco style. The age is unknown. The ring is set with 1 European cut diamond of J (or better) color, VVS clarity that weighs approx. .95 ct. I can not find a single inclusions with my jeweler’s loupe. The diamond measures 6.75 mm with the bezel setting and it is 4.53 mm deep. 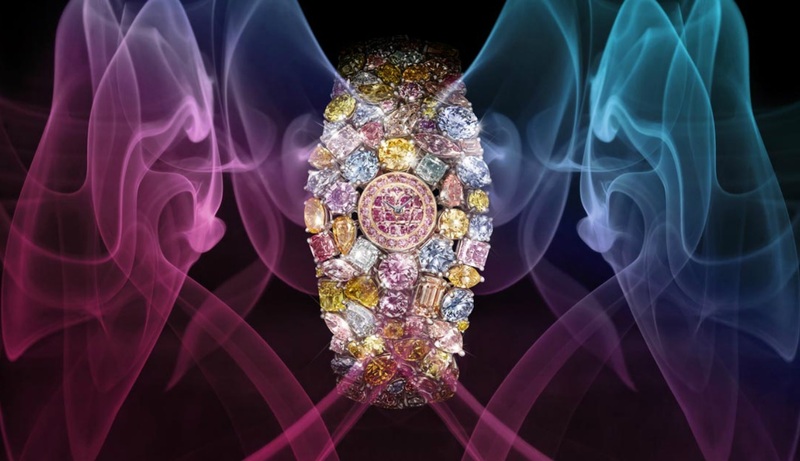 The ring is additionally set with 52 single cut diamonds of H-I-J color, SI clarity that weigh approx. .40 ctw. These diamonds range in size from .005 -to .03 ct. 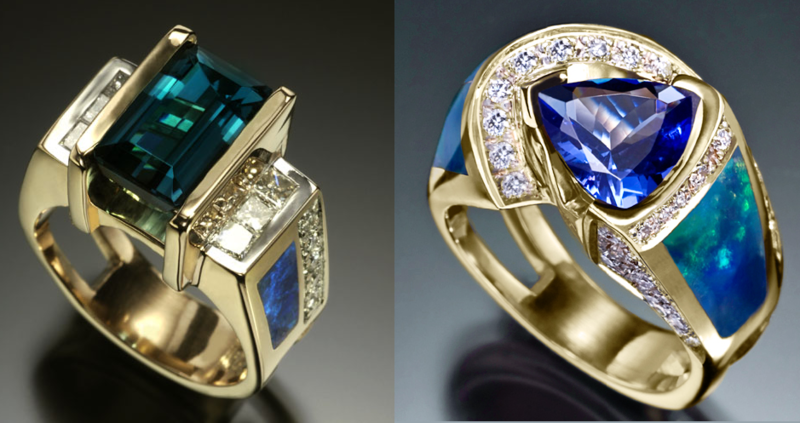 The ring is detailed with 38 natural blue sapphires that weigh approx. 1.20 ctw. These sapphires are cabochon cuts in various fancy shapes and of the finest quality. The head of the ring measures 9/16” square and it sits almost 3/8” high. The ring size is a 7.75 and the total weight is 5.7 grams. 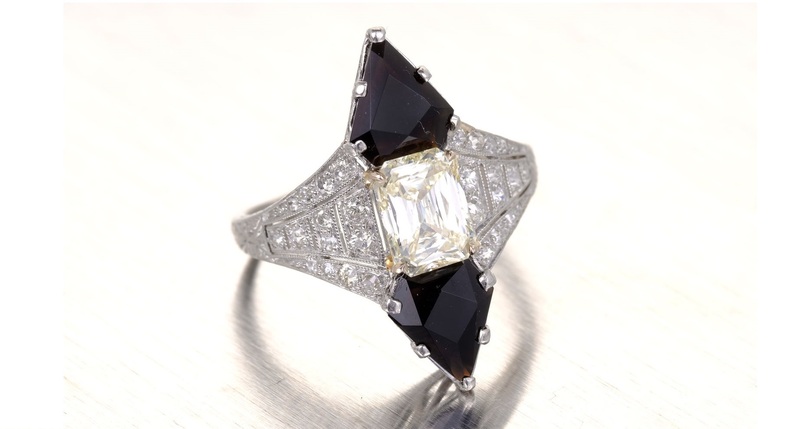 This is a Gorgeous and original antique ring that was made in the Art Deco style during the 1930s. It is handmade from Platium. The ring is set with 1 round old mine cut diamond (center) of L color, VVS1 clarity that weighs approx. 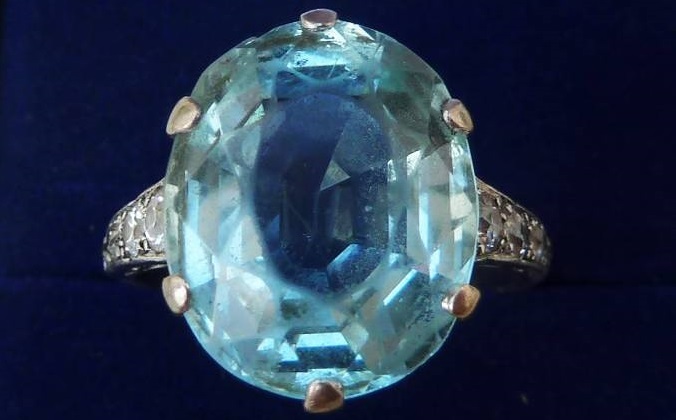 1.25 ct. The color is in the faint yellow color range and I can not find a single inclusions when using my 10x jeweler’s loupe. It has a tiny tiny nick on the table facet that can not be seen with the naked eye. This diamond measures 7.6 mm with the bezel setting and it is 3.45 mm deep. 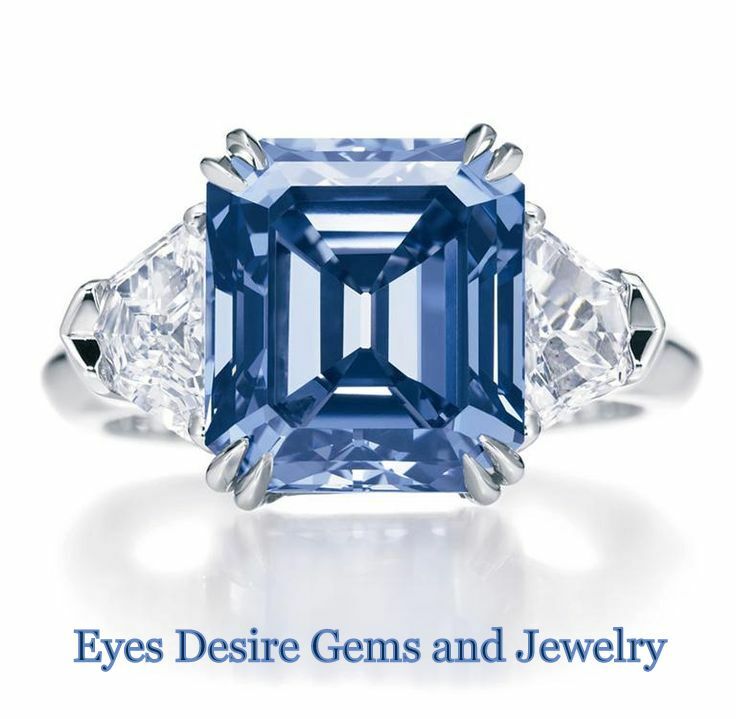 The center diamond is framed with 22 natural blue sapphires that weigh approx. .50 ctw. These sapphires are near square shaped and channel set with a darker blue color. The ring is detailed with 36 rose cut diamonds that weigh approx. .38 ctw. These diamonds are white and clear and they have a spread of .01 ct to .04 ct. 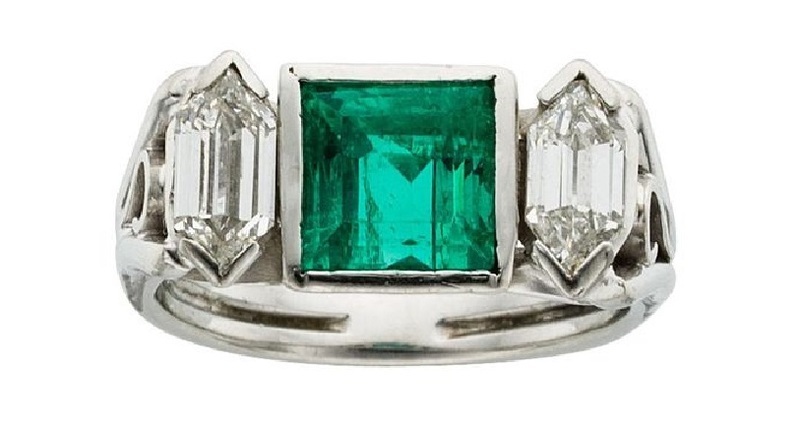 This is an original antique cocktail ring that was made in the Art Deco style during the 1930s. It is handmade from Platinum and originates from France. It has the Mker’s mark ‘LIF’ and a worn ‘PARIS’ stamp. The ring is centrally set with 1 Old European Cut Diamond of G color, SI1 clarity that weighs approx. 1.0 carat. This diamonds has one pinpoint inclusions in the center, but you have to know it is there to find it. Otherwise, this diamond is completely clear and would have a VVS grade. I can not grasp it to get a precise measurement, but it is very close to 6.45 mm in diameter by 4 mm deep. 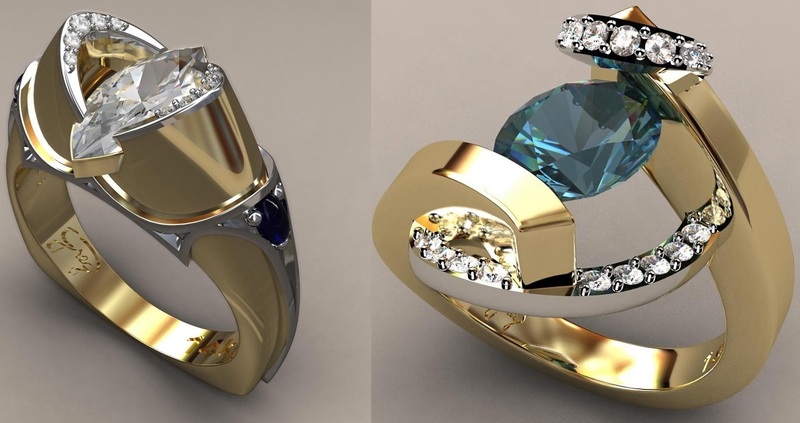 The ring is also set with 46 roundish old mine cut diamonds of F-G-H color, SI to I clarity that weigh approx. 1.26 ctw. The total diamond weight is approx. 2.26 ctw. 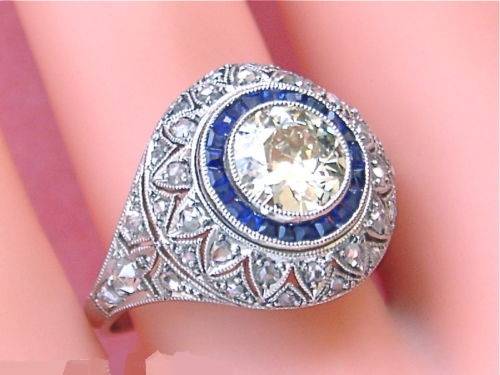 The ring is detailed with 40 natural blue sapphires that weigh approx. 1.30 ctw. These sapphires are French cut and channel set of the finest quality. 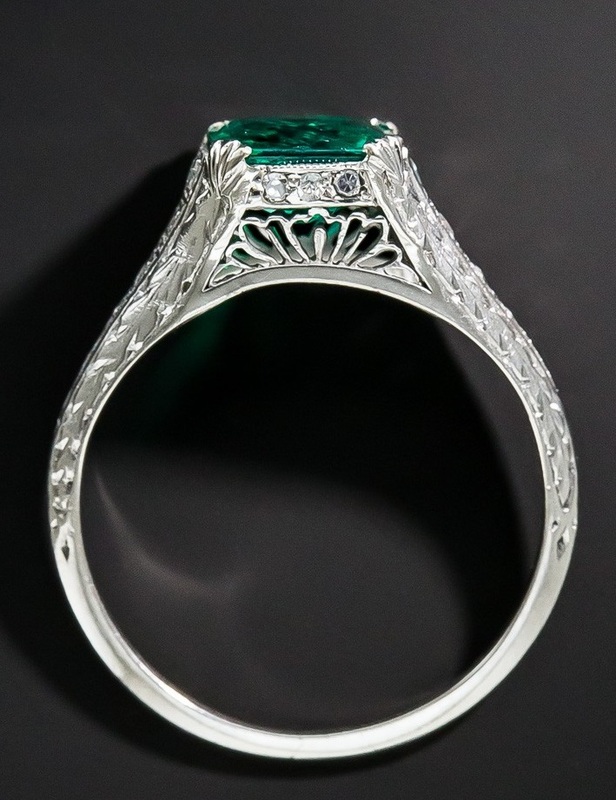 This is an estate cocktail/engagement ring that was made in the Art Deco Style from Platinum. 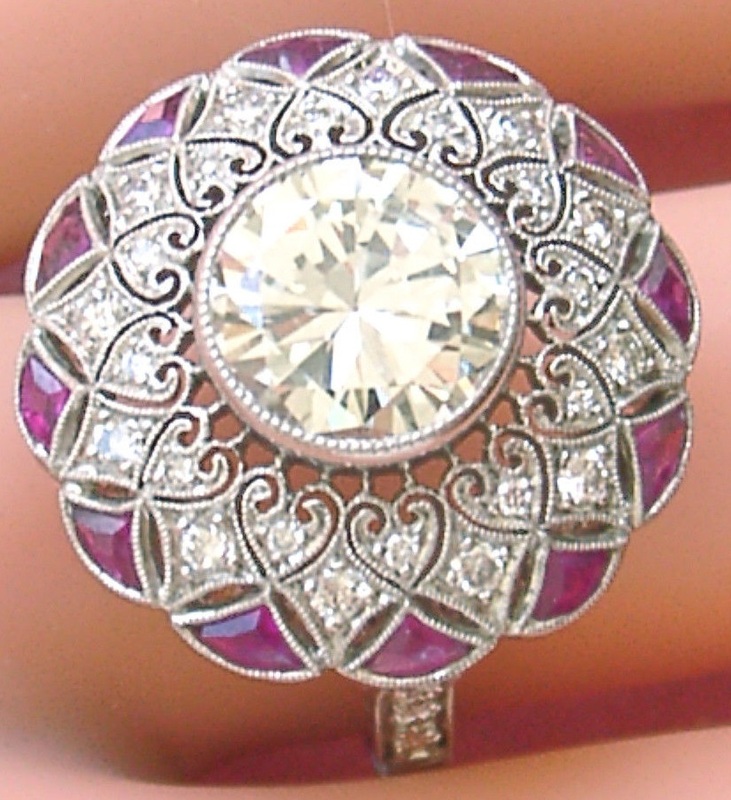 The mounting is post 1950 and the center diamond is an original antique. The ring is centrally bezel-set with 1 European Cut Diamond of J color, I2 clarity that weighs approx. 1.15 ctw. This diamond measures approx. 6.7 mm in diameter and it is 4.27 mm deep. In my opinion, this is the ideal I2 clarity stone. The frame and shoulders of the ring are set with 41 brilliant cut diamonds of G – H color, SI clarity that weigh approx. .82 ctw. The total diamonds weight is approx. 1.97 ctw. 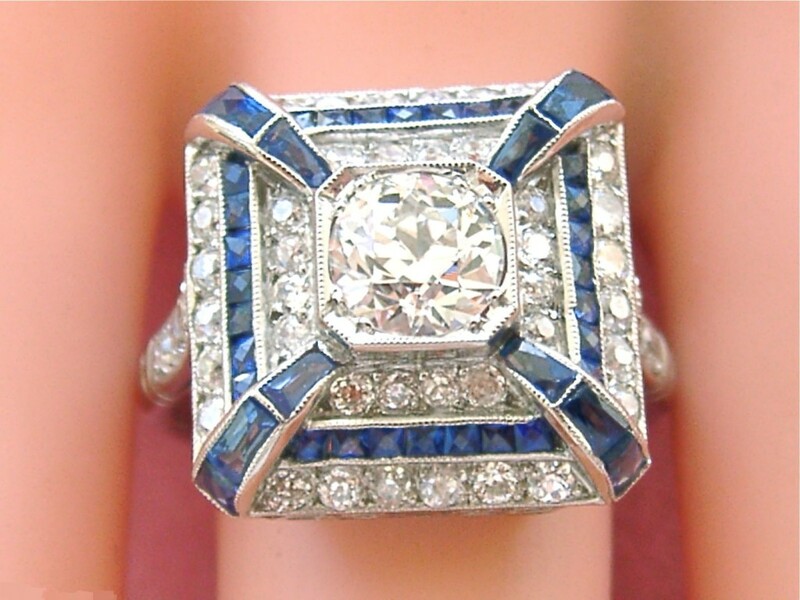 The ring is detailed with a natural blue sapphire halo that is set channel set with 20 sapphires. There are an additional 4 sapphires set in the shoulders. The sapphires are fancy shaped and French cut weighing approx. 1.20 ctw. This is a fabulous cocktail ring that was made in the Art Deco style from Platinum. The age is unknown. The ring is centrally bezel-set with 1 marquise cut diamonds of J color, VS or better clarity that weighs .63 ct. and the weight is engraved in the shank. It measures close to 9 x 5.2 x 2.38 mm and I can not find any inclusions with a 10x jeweler’s loupe. The ring is also set with 12 roundish old mine cut diamonds of H color, SI clarity that weigh approx. .38 ctw. The total diamond weight is approx. 1.01 ctw. 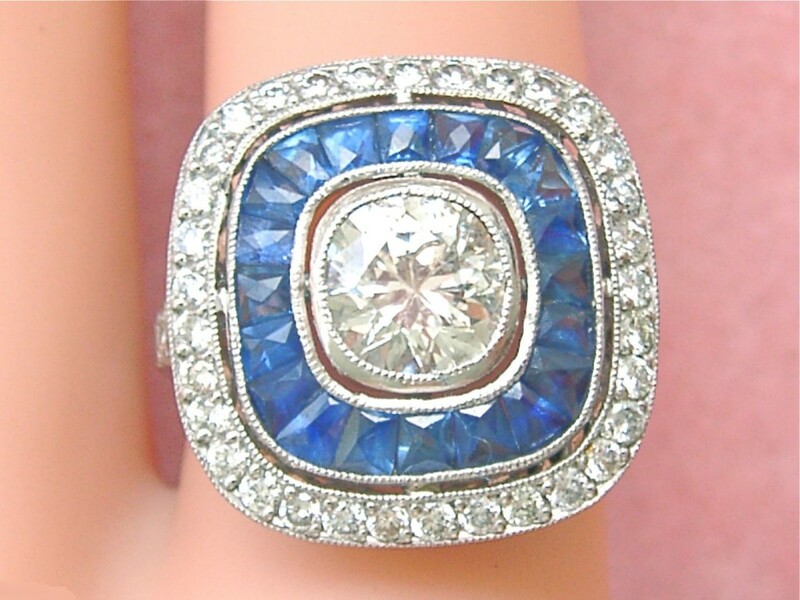 The ring is detailed with 34 natural blue sapphires that weigh approx. 2.0 ctw. These sapphires are fancy shaped French cuts that are channel set and of the finest quality. The marquise shaped head of the ring measure 1” north to south by 7/16” at the widest point. The total weight is 5.8 grams and the ring size is a 7. The lower gallery is finely detailed. LOOKING FOR SAPPHIRE AND DIAMOND ESTATE JEWELRY? 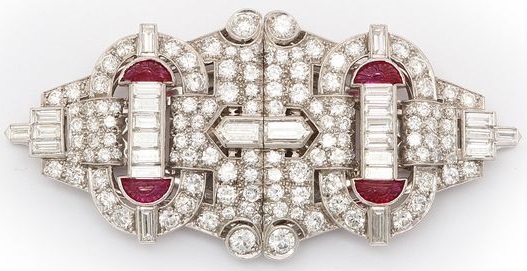 Art Deco Platinum, Ruby and Diamond Ring Set with one shield step-cut ruby approximately 2.01 cts., and one shield step-cut diamond approximately 1.40 cts., flanked by 8 baguette and fancy-shaped diamonds, set with 50 single-cut diamonds, circa 1920. This absolutely stunning antique originates from the 1930’s. 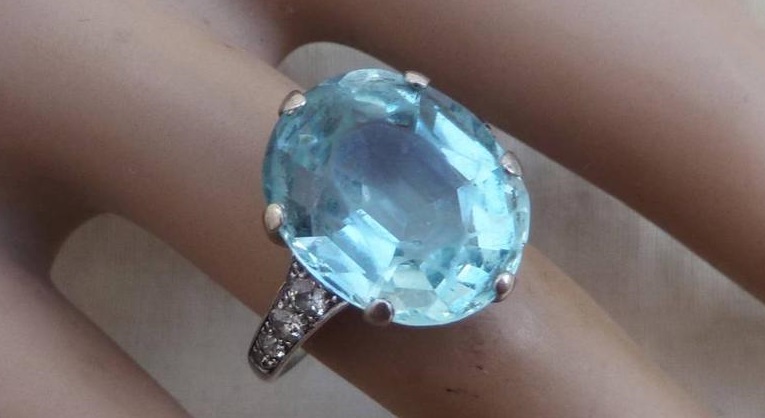 At the focal point is an astonishing aquamarine measuring just over 15mmx12mm. This outstanding gemstone is at least 12ct and has a wonderful blue coloring, you will not see much better. Flowing down the shoulders are a total of eight bright old cut diamond totaling 1/2ct complimenting the aquamarine perfectly. The ring is solid platinum with plat hallmark and is in excellent condition for its age. A fabulous one off antique ring just waiting to be shown off. 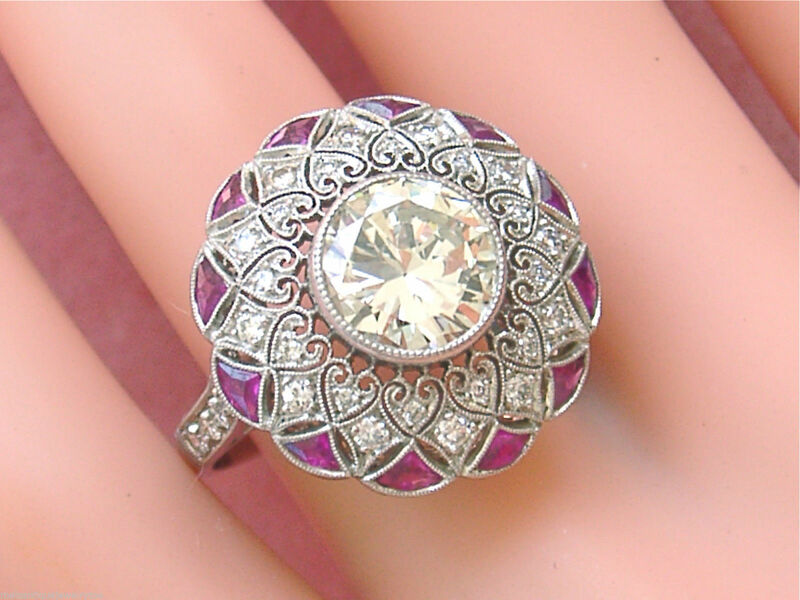 This is an Exquisite estate ring that was made in the Art Deco style, post 1950, from Platinum. The age is unknown. The ring is centrally bezel-set with 1 BRILLIANT CUT DIAMOND of K – L color, VS2 – SI1 clarity that weighs approx. 2.80 carats. This diamond measures approx 8.8 mm in diameter and it is 4.87 mm deep. It is completely clear to the naked eye and has fabulous sparkle! There are two areas with inclusions that are needles and towards the edge of the diamond. You need a 10X jeweler’s loupe to find them. 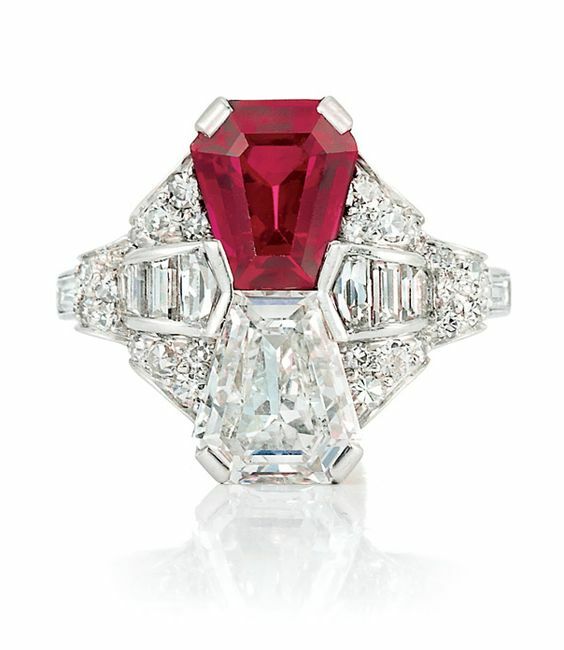 The ring is framed with 12 natural red rubies that are fancy shapes weighing approx. .70 ctw. 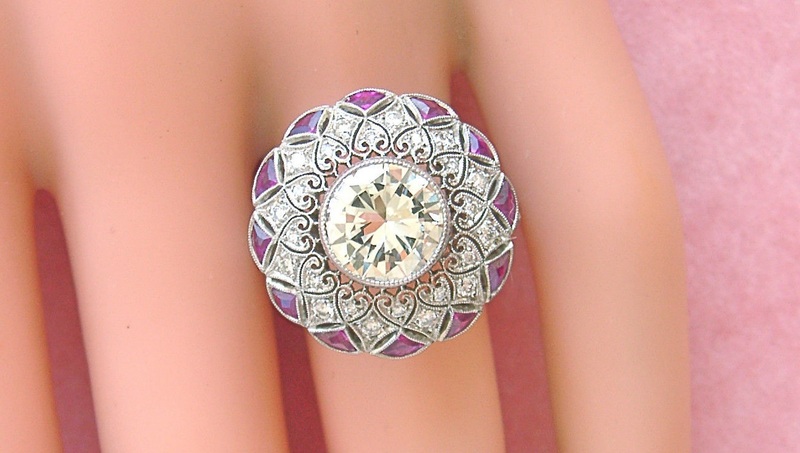 The ring has a Lacey design that is set with 32 Brilliant cut diamonds G-H-I color, VS to SI clarity that weigh approx. .62 ctw. Eight of these diamonds are set in the shoulders. The total diamond weight in the ring is approx. 3.42 CARATS! The head of the ring measures 20.5 mm in diameter and it sits 9 mm high. The ring size is an 8.5 and the total weight is 7.6 grams. The lower gallery is finely detailed. 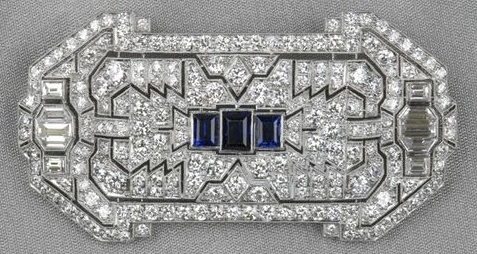 Art Deco Platinum, Sapphire, and Diamond Plaque Brooch, Marcus & Co.
Art Deco Platinum, Sapphire, and Diamond Plaque Brooch, Marcus & Co., centering three step-cut sapphires, with baguette- and fancy-cut diamond edges, and set throughout with transitional-cut diamonds, approx. total diamond wt. 4.30 cts., lg. 2 1/8 in., signed, in original box. 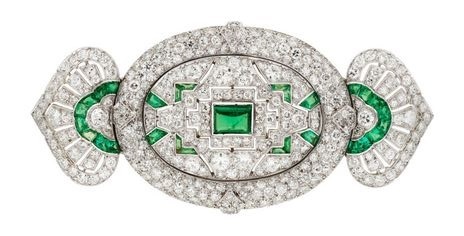 EMERALD AND DIAMOND DOUBLE CLIP BROOCH, 1930S. 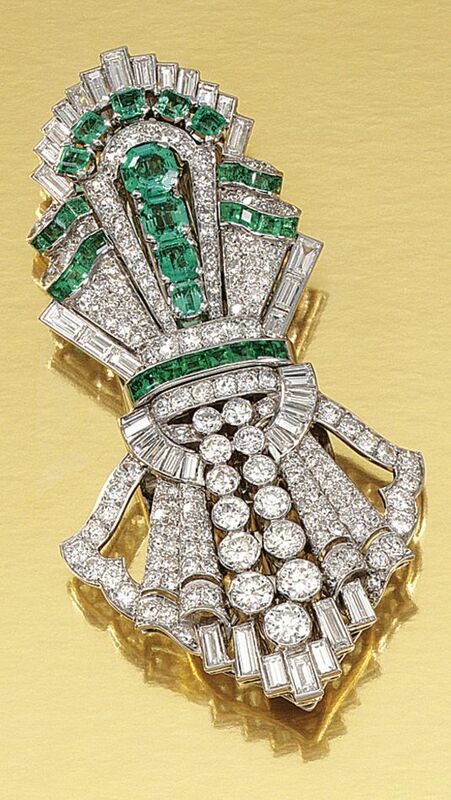 Each clip of geometric design embellished with stylized scroll motifs, set with circular-, single-cut and baguette diamonds, further accented with lines of step- and calibré-cut emeralds, fitted case. A diamond and emerald brooch, Tiffany & Co.
A diamond and emerald brooch, Tiffany & Co. of foliate motif, detailed with calibré-cut emeralds and baguette-cut diamonds, further accentuated by a ribbon of round brilliant-cut diamonds; signed Tiffany & Co; estimated total diamond weight: 2.50 carats; mounted in platinum; length: 2 1/4in. 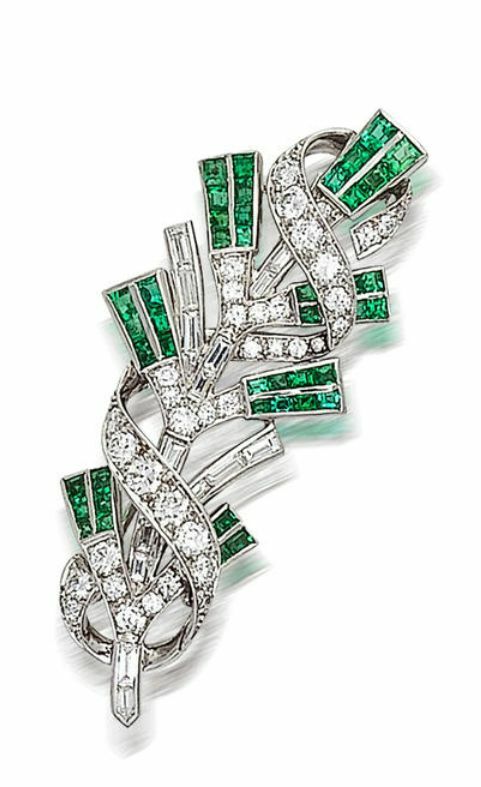 Art Deco Diamond, Emerald, Platinum Brooch, Lacloche Frères The brooch features European-cut diamonds weighing a total of approximately 7.55 carats, accented by single-cut diamonds weighing a total of approximately 1.05 carats, accented by emerald and baguette-shaped emeralds weighing a total of approximately 1.85 carats, set in platinum, completed by a pinstem and catch on the reverse, marked Lacloche, Paris. 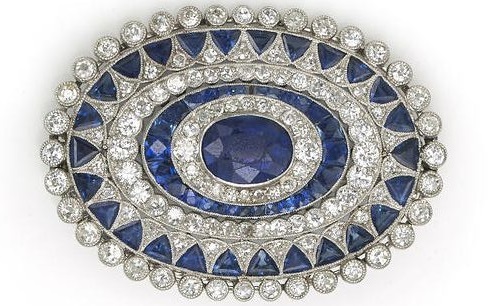 An art deco sapphire and diamond brooch, circa 1925 centering an oval-shaped sapphire framed with several successive rows of old European and single-cut diamonds and calibré and triangular-cut sapphires; central sapphire weighing approximately: 2.50 carats; estimated total diamond weight: 2.60 carats; mounted in platinum. 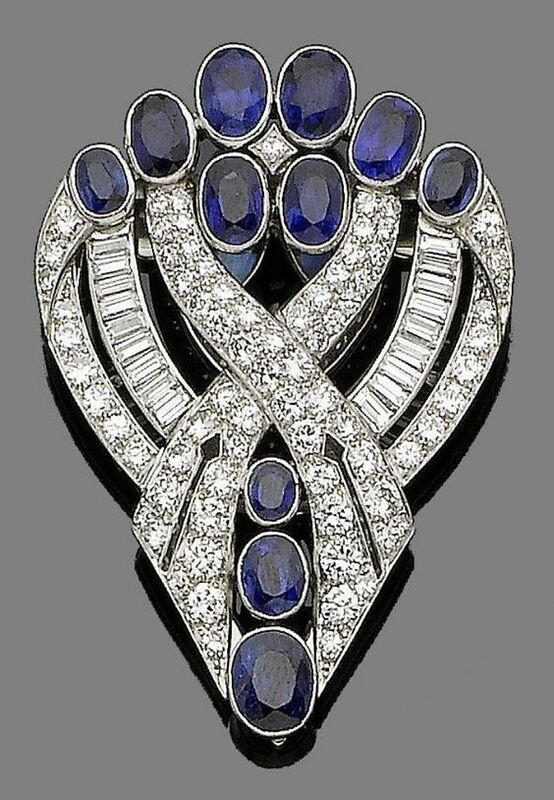 An art deco sapphire and diamond clip brooch, by J R Ogden & Sons, circa 1935. 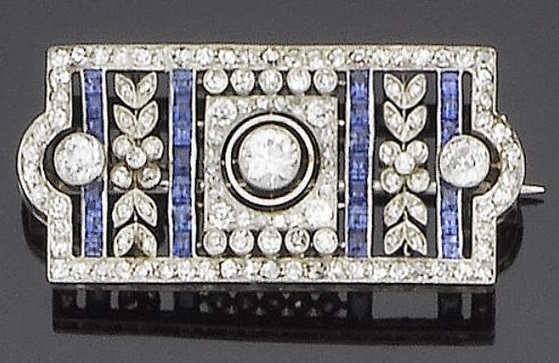 The tapering openwork plaque of scrolling design collet-set with graduated oval-cut sapphires, brilliant and baguette-cut diamonds, diamonds approx. 2.85cts total, signed J R Ogden & Sons, length 4.9cm, fitted case.